Smoked turkey breast is something I’d never have thought to try before I drove north from Texas to Nebraska. I’m not a white meat guy at Thanksgiving time and the only smoked turkey breast I’d ever had was Oscar Meyer lunchmeat, but there was a really cute girl behind the counter of Rudy’s Country Store BBQ in Norman, Oklahoma, and she sweet-talked me into trying the smoked turkey. I’d already ordered the brisket, but she gave me a sample of that turkey and I was in another world. It was as good as any pulled pork I’ve ever had (she was really, really good looking) and I had to get a sandwich for the road. I didn’t wait until I was hungry, but as soon as I could hold more food I devoured that thing. I also bought a bottle of Rudy’s sauce, because I knew I was going to try to make it as soon as I got home. Now, mine turns out delicious, but never quite as good as it will with a real smoker in a BBQ joint, so be sure to give theirs a shot. You need a turkey breast, a brining bag, 6 garlic cloves, whole peppercorns, brown sugar, and non-iodized salt. I used fine ground sea salt, but I’ve had great luck with pickling/canning salt before. Smoking a bone-in turkey breast will work great, but I’ve only ever used boneless, and about 4-5 Lbs at a time. I like to bone one out myself, but you might as well let your butcher do it. Aside from the brining bag, you’ll need some other hardware you might not have. Butcher’s twine, smoker wood chips (my favorite is applewood, mesquite is more traditional BBQ), and a smoker box for a gas grill. I’m an admitted novice when it comes to charcoal grill smoking, but there are big wood chunks right next to the smoker chips which I assume are meant to serve this purpose. At any rate, you can read about it here. To maximize the flavors of the turkey breast and make sure it doesn’t dry out on the grill, it needs to brine for at least 24 hours. To make your brine, use a gallon of warm water, a cup of salt, 3/4 cup of brown sugar, and whatever seasonings you like. For me, fresh garlic is a must, so I mince at least 6 large cloves, and add in a Tbsp of whole black peppercorns. 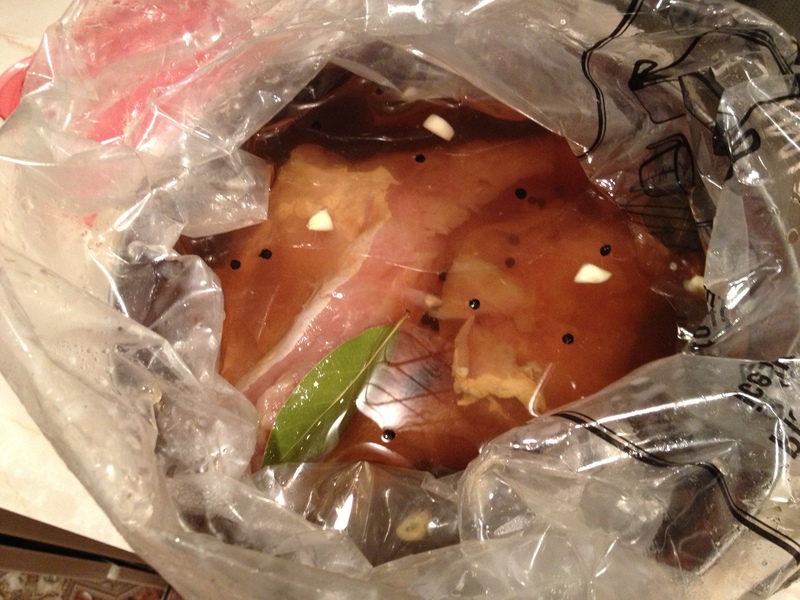 Make sure your brine is well mixed, and use the turkey brining bag to line a pot big enough to hold the turkey breast. Put the breast in the bag, and add enough brine to cover it. If you have too much brine, I recommend skimming a little of the water from the top into a separate bowl so that you maximize the amount of salt and sugar in the bag with the turkey. Put this pan into the fridge for at least 24 hours. Fill your smoker box with dry wood chips, and then dump those chips into a bowl of water and let them soak for at least 30 minutes. Fill a large pot with fresh water, dip the entire turkey breast into it to rinse some of the brine off, and set the breast onto a work space. 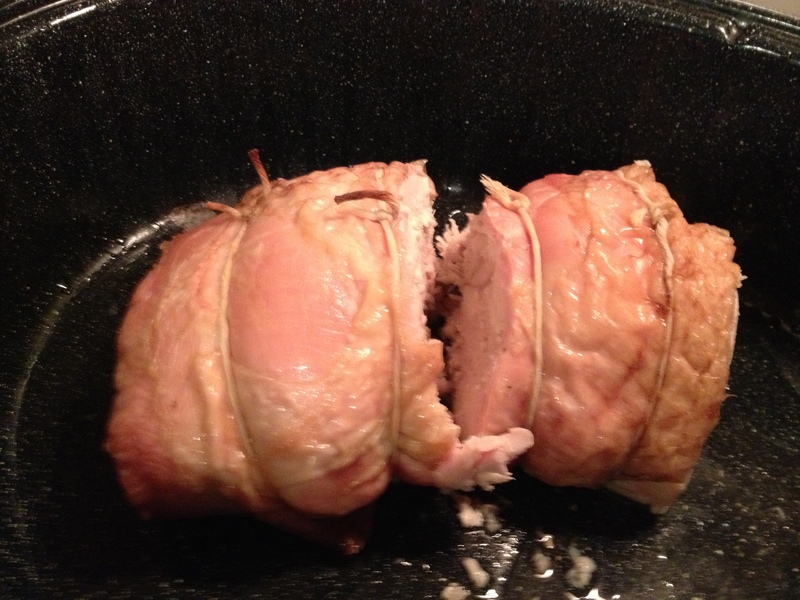 Use butcher’s twine to tie the breast into a tight roast. 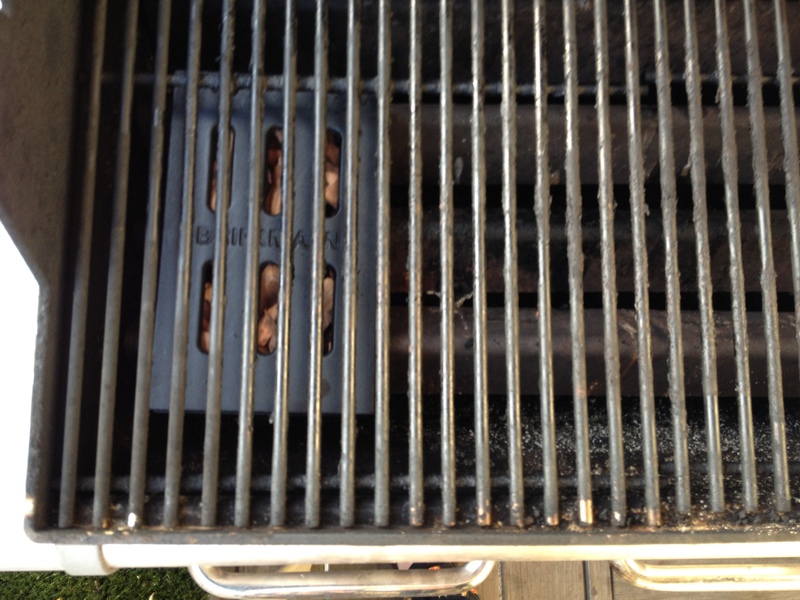 the Flavor Bars, off to one side, under the cooking grate on your grill. Light one burner between low and medium, and as soon as the grill gets to 225°F, put the turkey breast on the grill and cover. Let it smoke for three and a half hours, trying to keep the temperature under 300. Take it out and it’s ready to go. 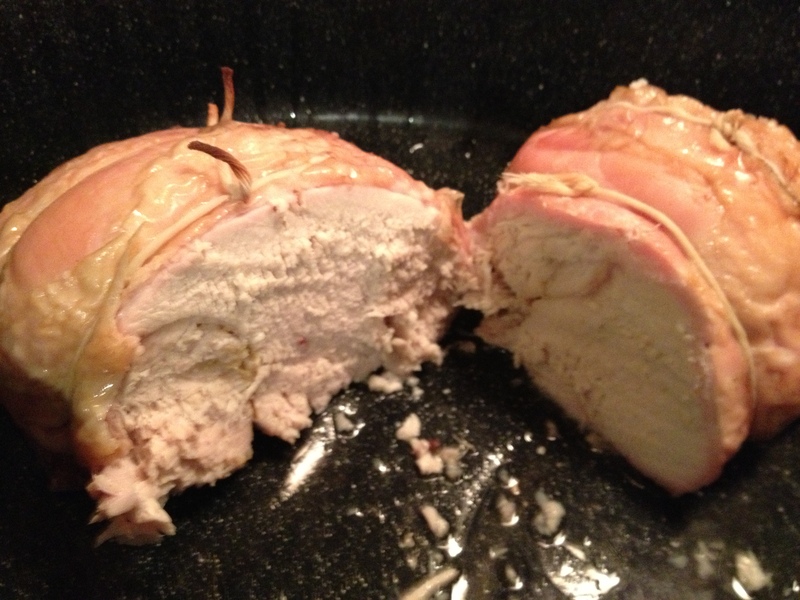 I’m a turkey farmer with a blog…mind if I feature this recipe? I will post a picture, short summary, and link to your blog post, if that’s okay. Thanks! I’d love for you to use my recipe! 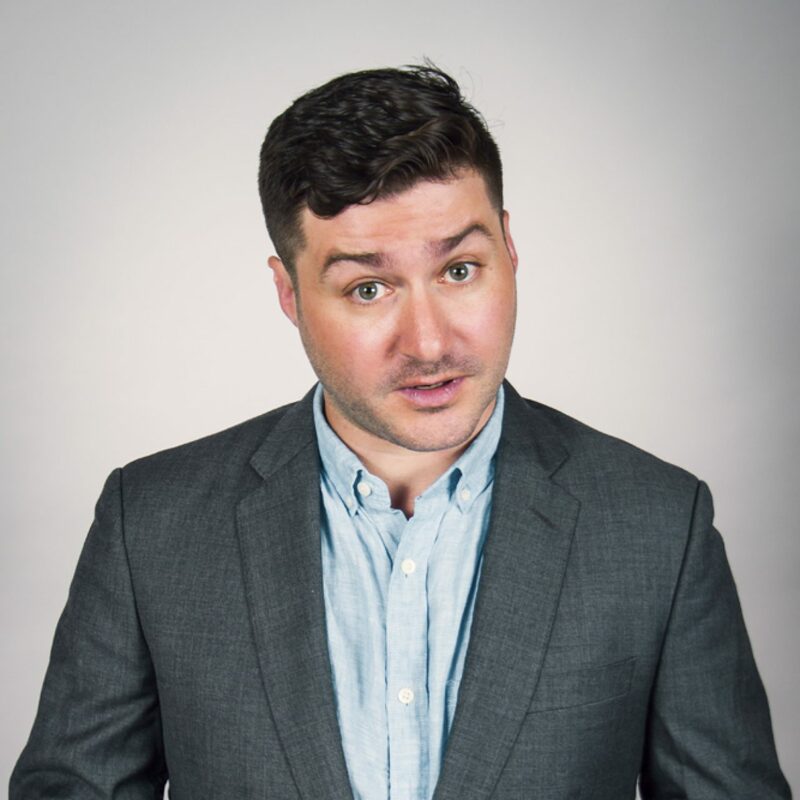 Let me know if there’s anything else you need – and I’ll keep you in mind if I have any turkey recipes in the future. Look great. I’ve just recently started experimenting with smoking meats. It’s a lot easier than it looks. Thanks for sharing. I’ll give smoked turkey a go. You mentioned butcher’s twine… Do you just wrap the breasts together? I can never find a turkey breast at the store over 1 1/2 pounds. When you bone out a whole breast you end up with two separate pieces. By tying these together, you end up with one big piece that will cook more evenly. I think it’s odd that you can’t seem to find a larger turkey breast; to be honest I’ve never seen them that small, unless they’ve been pre-cut and portioned out. You should ask the person at the meat counter if they’d be able to find you something bigger. Otherwise, just tie two of them together (or have the meat counter guy do it for you).